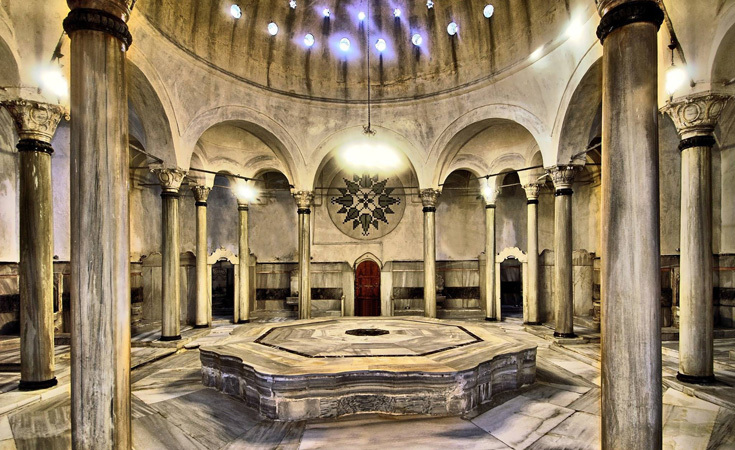 Hamam has the dictionary meaning in Turkish of a “public structure built for bathing.” Places set aside in homes for bathing are also given this name. 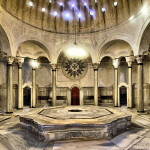 The first hamams to be internally heated and provide hot war were built in Roman times. The first general hamam known to exist was the Stabian baths in in Pompeii. 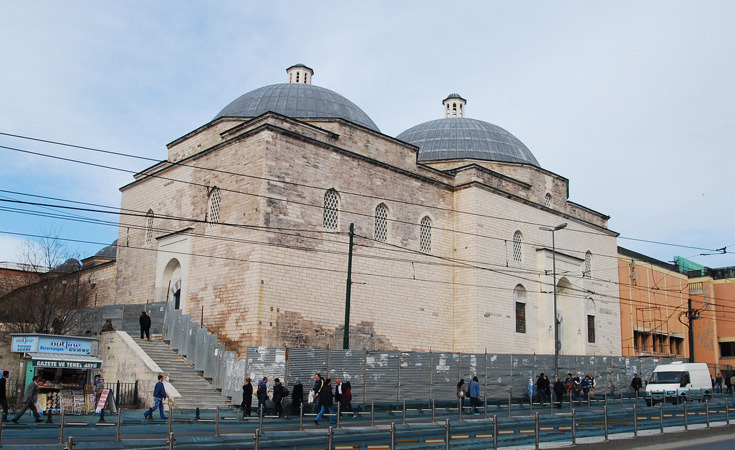 In monumental records the first hamams were built in the 1st Century B.C.E by Agrippa in Rome. The Caracalla baths – built between 206-217 C.E and still largely preserved today – cover an area of 25 thousand square meters. Its walls, furnishings and ceilings are decorated with mosaics and marble, and form one of the important focal points from where we take knowledge about the culture of daily life in the hamams of the ostentatious Roman Empire. Roman hamams were heated by a piping system behind their decorated floors and walls. Byzantine culture preserved the hamam but structures from this period are neither as big nor as important. 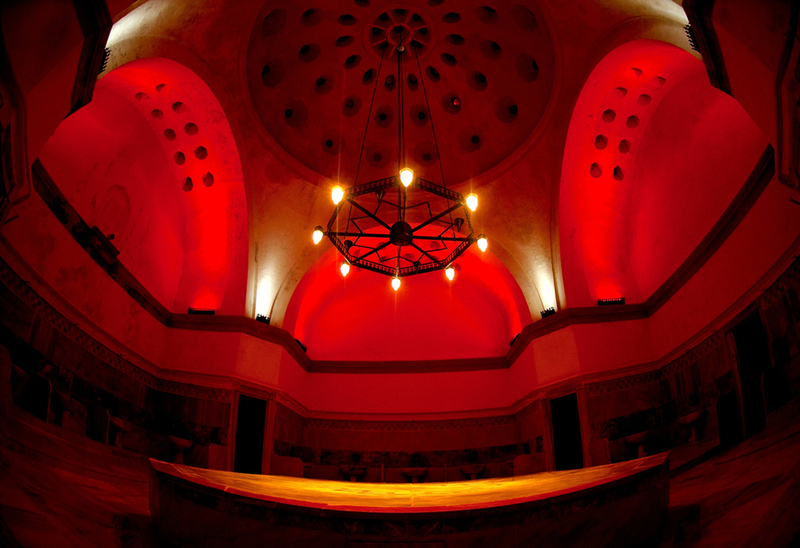 The hamam as a public structure regain its importance in Islamic civilizations. Hamams known as “Turkish” Hamams are divided into areas known as the ““soyunmalık” or camekân, the “soğukluk”, the “ılıklık”, the “sıcaklık”, the “halvet”, the “cehennemlik”, and the “külhan.” Like the Byzantines they were inspired by the Romans. They became important again particularly during the Ottoman period and such structures became more common. Most are built around a central plan, and either as single or double hamams. Some were built independently and others as part of larger mosque complexes. They were generally built to provide an income for mosques or other philanthropic organizations. The first examples of a hamam in Anatolia during the Turkish period is in Artuklular in South-East Anatolia. It is estimated that the Maristan Hamamı in Mardin is the oldest Turkish hamam in Anatolia, dating to the beginning of the 12th Century. Its structure is in the shape of a cross made of four iwans, and draws attention for square cells that make up its sıcaklık (or hot room). There are few mosques from the Seljuk period that survive to this day. The Kölük Hamam, a double hamam in Kayseri built in 13th Century was actually built by the Danishmends and repaired in 1210. During the Beylik period many small hamams were built in different regions. Of these good examples are the Meram Hasbey Hamamı from the Karamanoğulları period in Konya, and the Şifa Hamamı. 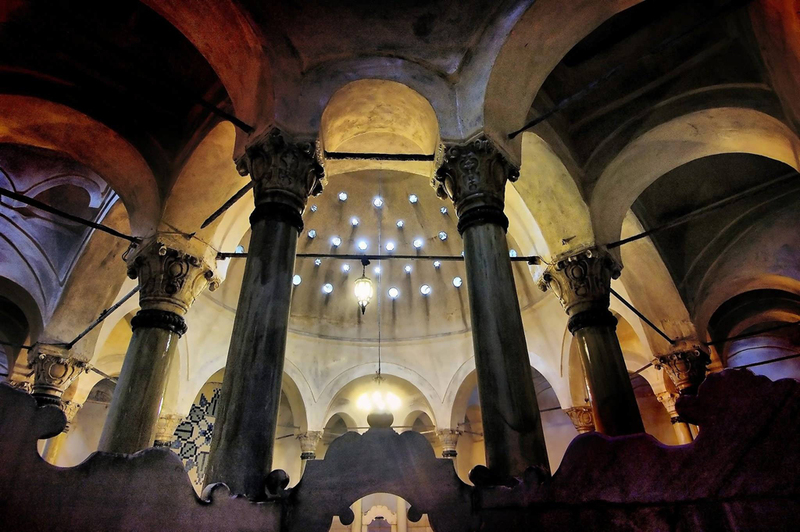 The hamam is one of the richest structures of Ottoman architecture. We do not have many surviving examples of these because most were allowed to fall into disrepair after their income generating period elapsed. They were built for functionality and simplicity, but were enriched by plaster and marble ornamentation and different decorative styles. 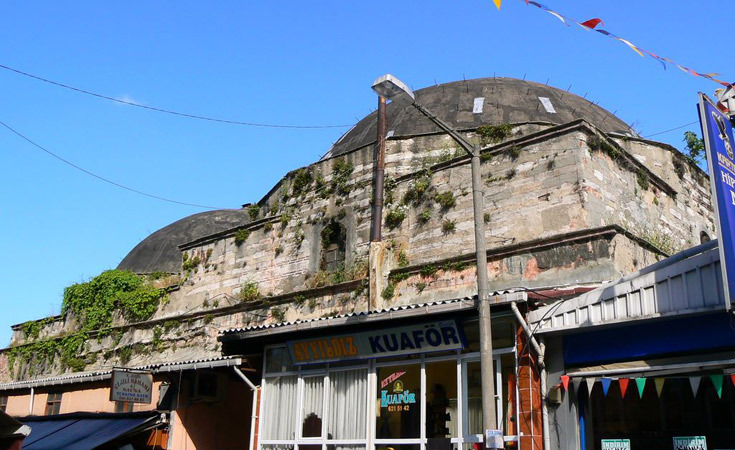 According to Evliya Çelebi the first example of such a mosqe was the Irgatlar Hamamı built by Mehmet the Conqueror. It shows its traces in the Azablar, Vefa and Eyüp Hamams. The Çukur Hamam in Fatih is bigger than the others. 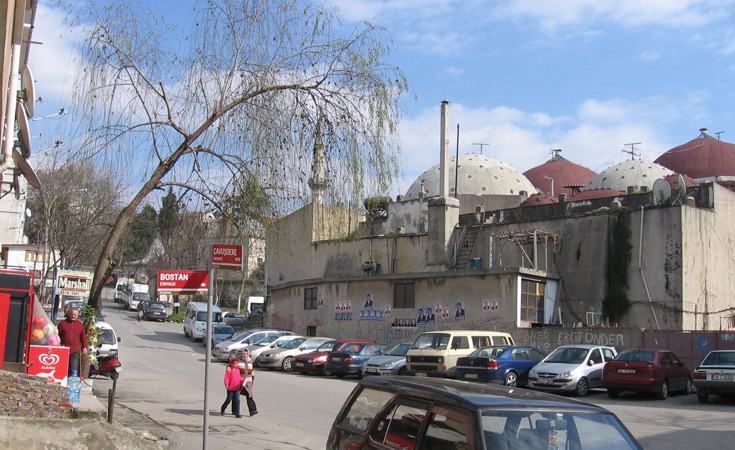 The principal hamams of Istanbul – the majority of which are still in operation today – are the İshakpaşa (Sultanahmet), Nişancı (Kumkapı), Mahmutpaşa, Gedikpaşa, Tahtakale and Bayezid hamams, the Hayreddin Paşa (Zeyrek) Hamam, built in the 16th Century by Sinan, the Sinan Paşa (Beşiktaş), Ayasoyfa (Sultanahmet), Edirnekapı, Kılıç Ali Paşa (Tophane), Valide Sultan (Üsküdar) hamams, and the Cağaloğlu Hamamı, built in the 18th Century.